Radiesse is a dermal filler that is made of calcium-based microspheres suspended in a water-based gel. It is a great choice for facial contouring and for correcting facial asymmetries. Like the hyaluronic acid fillers (Restylane and Juvederm), it can help soften the lines of the nasolabial folds and marionette lines. However, Dr. Greene believes that it is even more effective in contouring of the cheeks, chin, and jaw line, which can also help to achieve wrinkle reduction and soften the nasolabial folds as well. One of the many benefits of Radiesse is that it delivers immediate results for patients looking to erase wrinkles and re-contour certain areas of their face. It can also improve symmetry, which has been shown to improve attractiveness. In addition to replenishing lost volume, Radiesse also stimulates collagen production to promote a more long-term improvement. In many patients, this extended correction can last for up to one year. Like the hyaluronic acid fillers, there are very few side effects. There is virtually no risk of allergic reaction, and the most common side effects are mild swelling and bruising. The loss of midface volume is one of the hallmarks of facial aging, and this can lead to significant changes in the facial appearance. Historically, this was addressed with surgery to tighten the overlying skin and lift the deeper soft tissues. More recently, volumizing fillers have been used to restore volume and provide a similar ‘lift’ without surgery. Radiesse is an ideal filler to replenish lost volume in the cheeks. Since it is composed of calcium hydroxyapatite, it integrates well with the cheekbones. It can also be molded and shaped into the desired contour after injection to create the Radiesse Midface Cheek Lift. Patients who are good candidates for the procedure can expect to long much younger and refreshed once volume is restored. Virtually anyone with facial volume loss is a candidate for treatment with Radiesse, as well as individuals with poorly defined cheekbones. Many patients were born with poorly defined cheekbones; for these patients, Radiesse is an ideal filler choice. 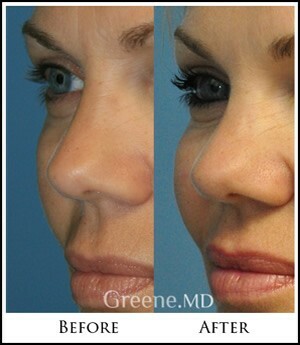 Dr. Greene also uses Radiesse for augmentation of the chin, temples, or jaw. Finally, Radiesse can be used to fill the nasolabial folds and other areas of the lower face. Overall, Radiesse is a very versatile product that can be used in a number of areas. Patients of all age groups can benefit from Radiesse treatment, but those with more significant skin laxity and volume loss tend to require more filler volume. Many patients choose to undergo facial filler treatments as an alternative to surgery, in order to avoid anesthesia and potential complications. WHAT CAN I EXPECT WITH A RADIESSE TREATMENT? Dr. Greene’s specially formulated topical numbing cream is applied for 15 to 20 minutes prior to treatment. The treatment takes approximately 15 to 30 minutes to perform. The treatments involve very small needles, and are virtually painless due to the numbing cream and Dr. Greene’s gentle injection technique. Dr. Greene also adds lidocaine (an anesthetic agent) to the Radiesse prior to treatment, which further enhances comfort. After Dr. Greene injects the Radiesse, he then massages the area to ensure that it is properly distributed. Patients may return to normal activities immediately after treatment. 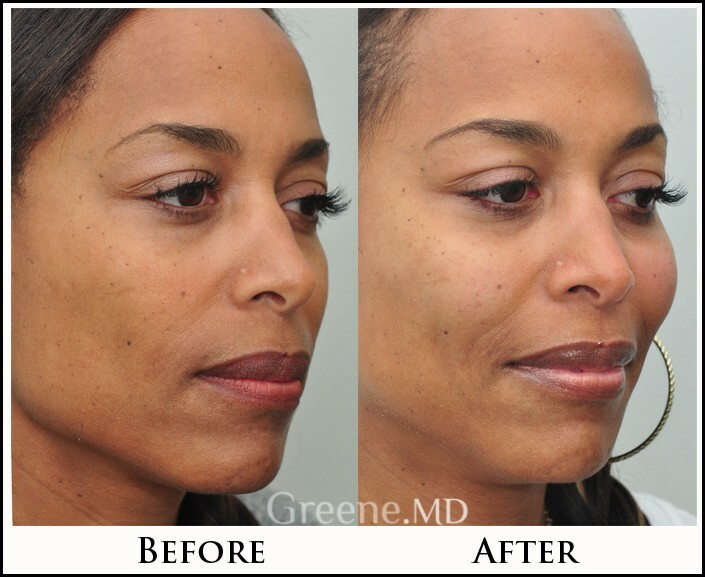 Dr. Greene is an injectable specialist who is considered to be a leading expert in facial fillers. He is a national trainer for Allergan, lecturing and training other physicians how to properly inject facial fillers. 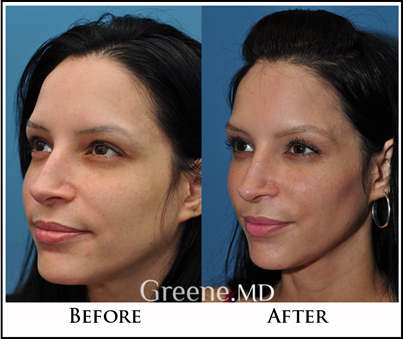 Dr. Greene takes an innovative anatomic approach to filler treatments, which leads to more natural, long lasting results. As one of the top injectors in Florida, he customizes treatments for each patient, which often includes a combination of different fillers and techniques in order to achieve the best outcomes. Radiesse is a facial filler made up of calcium hydroxyapatite, a naturally occurring substance, that is suspended in a water based gel. Its unique properties give it an excellent lifting capacity, making it well suited for restoring volume and contour in areas such as the cheeks, temples, and chin. WHAT SHOULD I EXPECT AFTER A RADIESSE INJECTION? Results are immediate and can last up to 1 year, or even longer in some patients. The duration of filler correction depends on the facial area treated, the injection technique, and the rate that the patient ‘s tissues break down the filler. IS THERE ANY DOWNTIME AFTER A RADIESSE INJECTION? There is no downtime after treatment, and patients may return to their normal activities. WHAT ARE THE COMMON SIDE EFFECTS OF A RADIESSE TREATMENT? HOW DO I KNOW IF RADIESSE IS RIGHT FOR ME? To learn if Radiesse is right for you, Dr. Greene will perform a thorough consultation. 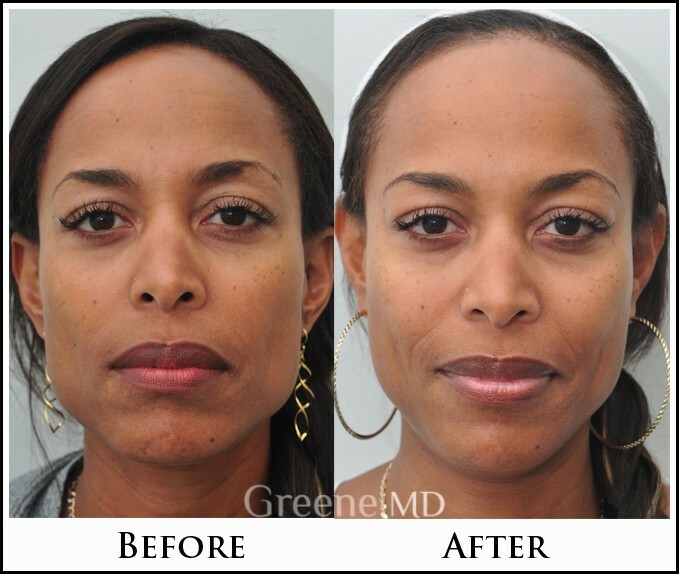 Dr. Greene has experience with a number of different fillers, and will select the best filler combination for you. DOES RADIESSE REQUIRE ANY SPECIAL TRAINING OR EXPERIENCE? All facial fillers require extensive experience in order to achieve the absolute best results. Use of a filler such as Radiesse requires experience, expert judgment, and advanced understanding of facial anatomy. 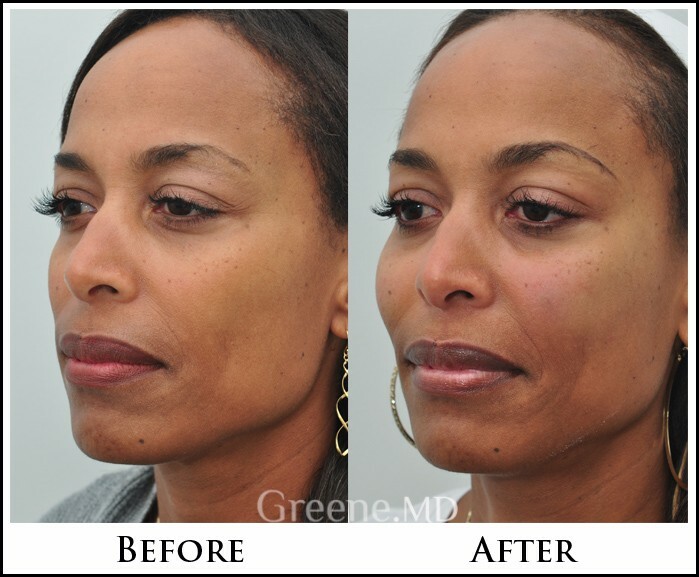 Dr. Greene is a double board certified facial plastic surgeon and national injectable trainer, and has performed thousands of filler treatments. ARE THE TREATMENTS WITH RADIESSE PAINFUL? At Dr. Greene’s office, patients find that there is almost no discomfort during treatment. Dr. Greene has a pharmacy specially formulate a numbing cream for his patients. He also mixes lidocaine with the Radiesse to enhance patient comfort. CAN RADIESSE BE COMBINED WITH OTHER FACIAL FILLERS? Radiesse can often be combined with other facial fillers. In fact, Dr. Greene often uses different fillers for the same patient in order to achieve the absolute best result. Radiesse is well suited for many areas of the face, such as the cheeks, but is not ideal for certain areas like the lips or the tear trough (nasojugal groove). CAN RADIESSE REALLY BE USED FOR HAND REJUVENATION? Like the face, the hands lose volume during the aging process. Radiesse is an excellent filler choice for restoring volume to the hands. WHAT AGES ARE MOST APPROPRIATE FOR TREATMENT WITH RADIESSE? Theoretically any patient with deficiency in areas such as the cheeks or chin could benefit from Radiesse treatment. Patients with early fat volume loss and excellent skin elasticity often require less filler to achieve correction. Older patients, on the other hand, typically require more filler to achieve optimal results. But overall, there are no absolute age limits for Radiesse treatment.